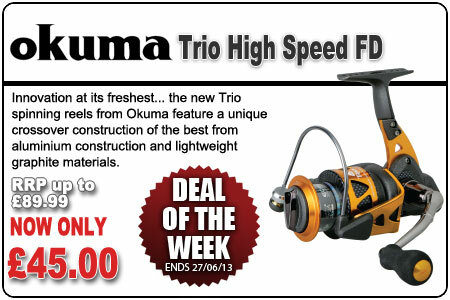 Deal of the Week - Okuma Trio High Speed FD Reels! 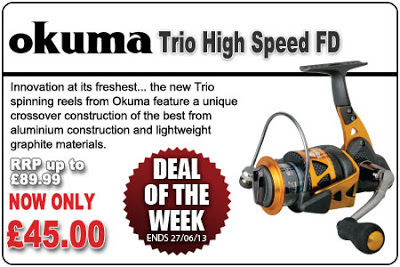 Innovation at its freshest...the Trio High Speed spinning reels from Okuma feature a unique crossover construction. Okuma took the best from aluminium construction and lightweight graphite materials and created a distinctive new concept in reel design. The solid one piece stamped aluminium reel stem and rotor arm are paired with lightweight graphite side plates and a rotor housing which provides strength where needed, and weight savings where possible. The Trio spool construction utilizes a multi-piece construction, housing the drag system in an aluminium drag chamber for added stability and smoothness, while utilizing a lightweight graphite housing for weight reduction and distinctive styling.